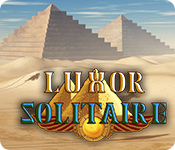 Luxor Solitaire is rated 4.2 out of 5 by 11. Rated 5 out of 5 by Marja67 from Good Game. Pretty graphics. Just right challenge. Lots to do.Good music. Rated 5 out of 5 by DRAGONWYN from Wonderful game Beautiful solitaire game. Love the music too, I usually mute the music but this was enjoyable trial time. I will be buying this one with my next game credit. Rated 5 out of 5 by JeansLady1 from Many things to like There are so many things to like about this game that I decided to write a review. Any Egyptian themed game immediately catches my eye. High-lower is my favorite style of solitaire. Being able to replay levels to get the 3 stars is a big plus. I was surprised that the player doesn't get to select the type of building to be built, but I enjoy the building aspect of the game anyway. I especially like what the devs have done with the boosters. As mentioned in another review, there are different boosters to select from at the beginning of each level - purchased with coins you earn during the game. You can have up to three boosters to start each level. The boosters don't cost much at all, so you usually have plenty of coins to purchase whatever you want. But once you use one, you have to purchase it again for the next level. It's wonderful to be able to purchase a booster with 10 or 15 coins instead of an exorbitant amount of coins as in most other games like this. Having 120 levels makes it a good buy, also. 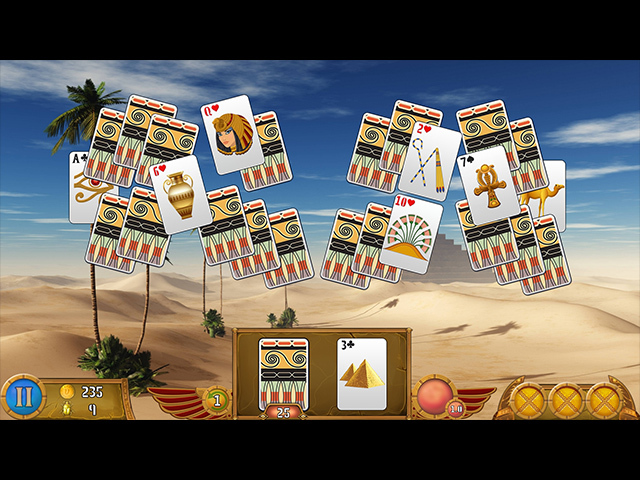 Rated 5 out of 5 by Kiandi from Building Luxor In A Day A very enjoyable solitaire game! I like the larger cards and the fact that after you collect the golden bug, the game lets you finish clearing the cards! The graphics/sounds are good and the mechanics seems to run smooth. There are also trophies to be won! All in all, this is a great solitaire game to buy with a punch code! Rated 5 out of 5 by pennmom36 from GREAT TRI-PEAKS TYPE OF HIGHER/LOWER THAT BRINGS BACK FOND MEMORIES OF THE PAST Although Luxor refers to the ancient city of Thebes in this particular Luxor Solitaire game, it sure does stir up some fond memories of a favorite pastime game series. 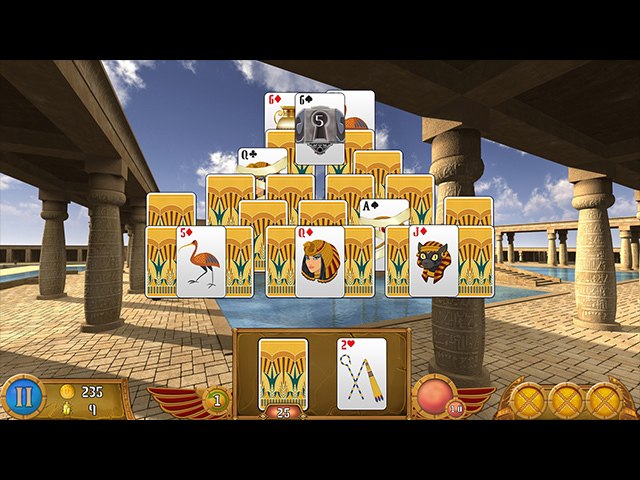 I loved all of the features in this game, including the Egyptian-themed graphics and music, and building Luxor, but most of all I loved the Tri-Peaks layout variations which, in my opinion, make solitaire games a little more challenging. There are 120 Solitaire Levels and you can play in a Relaxed Mode or a Timed Mode which only allows you 10 seconds to decide which card to remove. I played in Relaxed Mode because I play solitaire games for the relaxation aspect. You can earn 3 Stars when you remove all cards from the board, (including the Scarab Cards) 2 Stars when 1 card remains and a single star when 2 cards remain, however, you must remove all Scarab Cards to continue, otherwise you will have to replay the level. You can choose from 7 different Egyptian-themed Card Graphics and 2 Card Font styles (menu tab during the game) there are 6 Trophy Achievements available, and you can set the Background pictures as Wallpapers (w/o the cards) Before the start of each level, you can buy and choose 3 different Boosters with the Gold you earn by removing cards. Once you use the booster, you will have to buy that booster again before being able to use it because they are a one and done booster, but they are very cheap, 10-15 gold coins per booster. The Mummy Booster gives you a Joker when selected (if you don't use them they will become available for the next round) The Scarab Booster removes 2 Open Cards from the board, the Lotus Booster adds 5 More Deck Cards, the Ankh gives you 1 more Undo (each level gives you 1 undo automatically, if you use it and have to replay the level you will get another undo) the Horus Booster lets you see the Top Deck Card. My only complaint is that the Boosters you choose are shown on the bottom Right, but they are just icons without labels and it's easy to forget which booster does what, especially if you don't use them right away, this was simply a pure oversite, you won't find out if you chose the right booster until you use it! Fyi: one of the achievements is to complete 5 levels in a row w/o using boosters. Scarab Cards must be removed to continue to the next level, and the Scarabs are used to build Luxor. You don't get to choose which structure to build, it just moves on to the next available one. 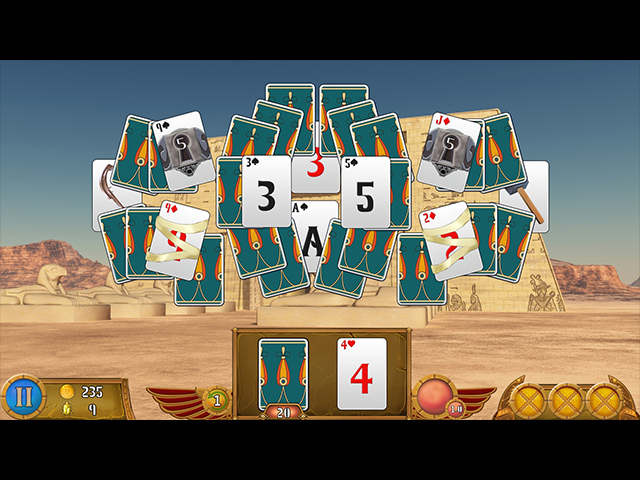 There are the usual Obstruction Cards as well, Ivy Covered Cards that require uncovering and using the Sword Card, Stone Cards that require uncovering and using the Hammer Card, Mummy Cards that require the card be played twice to remove, and Lock Cards that require making a Combo of a Specified Number as shown inside the lock. Solitaire is one of my favorite genres, but it has to have certain features such as being able to remove all cards, not just special cards, I have to be able to replay the levels as often as I want, it has to be a higher/lower type or anything other than mahjong types and it has to be fun to play, and somewhat challenging. Luxor Solitaire fits all my criteria so this is a definite buy for this solitaire fan, well done Lazy Turtle! Rated 3 out of 5 by Suzanne22222 from Needs a fix Being a regular solitaire player I am used to a game getting harder and harder but it is impossible towards the middle end to win 3* and therefore you cannot progress further. This is a waste of a gamers money. All that is needed is a fix to enable the players another deal so at least they could progress until the end of the game. Otherwise this game is not worth it I feel. Rated 3 out of 5 by pearl_si from impossible to win a hand after demo is over This game was fun and I purchased it before finishing the demo. Shortly after purchasing the game it became impossible to win a hand and get 3 stars which is what I normally shoot for. Don't waste your money... don't really understand why it has to be so hard to win a hand. Rated 3 out of 5 by verimeri from overall it is good This is a nice high/low solitaire game. However, I felt that the amount of cards in the deck as compared to all you had to clear was often very inadequate. Even adding the extra five cards was not enough. Making buildings was nice but could have been so much better if the player were more involved in creating the buildings. In this game the player simply collects enough scarabs then clicks build. So, while ok it could use some improvements.